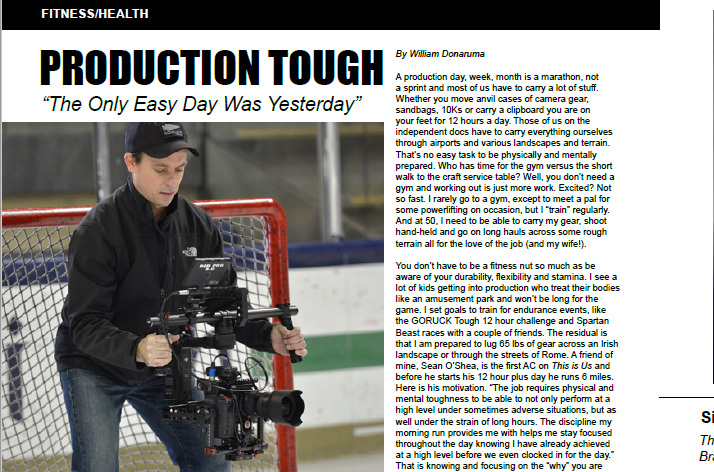 The new issue of HD Pro Guide Magazine, NAB Edition, introduces a new section for “Fitness and Health” with article, PRODUCTION TOUGH: “The Only Easy Day was Yesterday,” by William Donaruma. 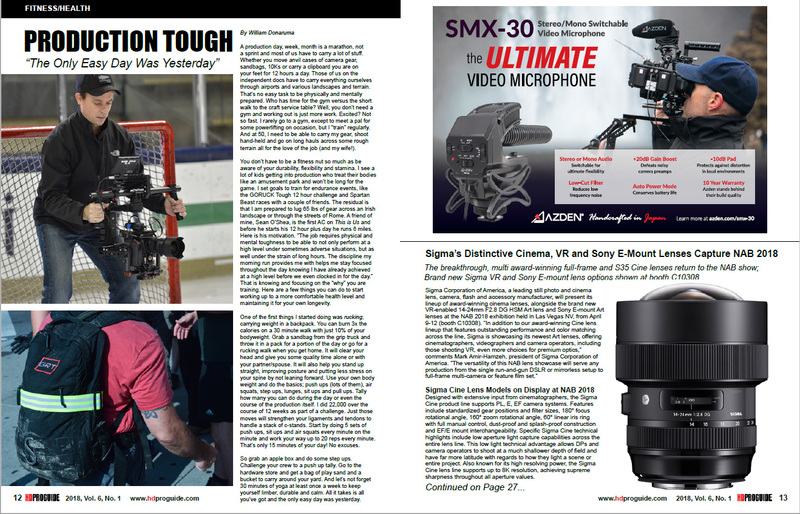 The magazine was exhibited with bonus distribution at the 2018 NAB Show in Las Vegas, Nevada. Excerpt: A production day, week, month is a marathon, not a sprint and most of us have to carry a lot of stuff. Whether you move anvil cases of camera gear, sandbags, 10Ks or carry a clipboard you are on your feet for 12 hours a day. Those of us on the independent docs have to carry everything ourselves through airports and various landscapes and terrain. That’s no easy task to be physically and mentally prepared. Who has time for the gym versus the short walk to the craft service table? Well, you don’t need a gym and working out is just more work. Excited? Not so fast. I rarely go to a gym, except to meet a pal for some powerlifting on occasion, but I “train” regularly. And at 50, I need to be able to carry my gear, shoot hand-held and go on long hauls across some rough terrain all for the love of the job (and my wife! )… Read the full article by picking up a copy of the newest issue at NAB, or follow the links below to sign up for a print subscription or digital subscription.